I’ve been writing my blog in Finnish for about a year and a half and I’ve enjoyed it greatly the whole time. It started out just as a hobby, as I wanted to try what it would be like to write from my enthusiasm towards food, nutrition and wellbeing instead of talking about it to my friends and family. And I also thought that it would be nice to share some healthy tips and nice recipes that I’ve found useful. After I started blogging, I’ve become even more interested in cooking, but also in taking pictures. Along the way I’ve written quite many posts and recipes here in my blog and I thought that I’d pick a couple of my favorites from the archives and share them with you, so that this space wouldn’t feel so empty. After looking at my archives, I decided to start with something that’s perfect for this season. I really like autumn with all its pretty colors, falling leaves, movie nights and the freedom to just stay at home and make a cup of really nice hot chocolate. But the fact that days are getting darker and there are more days with rain than with sunshine is a bit more challenging for me. So in order to survive, some really nice baked goods are truly needed. 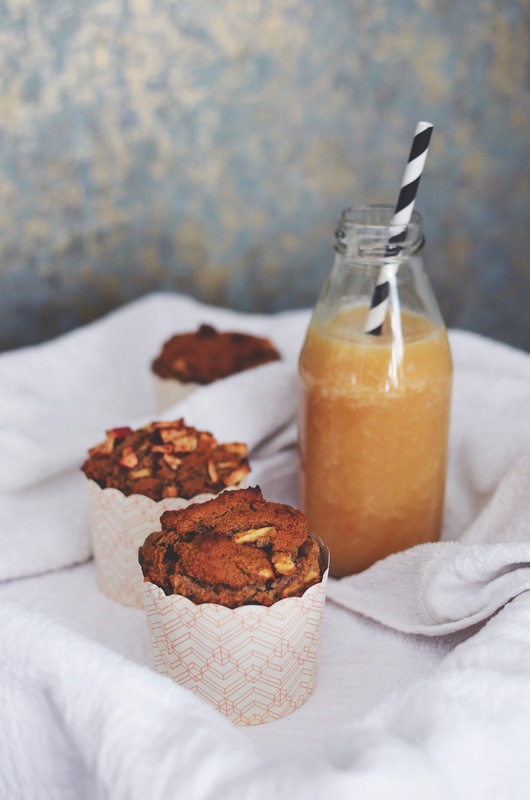 These apple date muffins are full of flavour and they’re really moist thanks to banana, oatmilk, olive oil and honey. No butter or white sugar, just ingredients that are good for you. 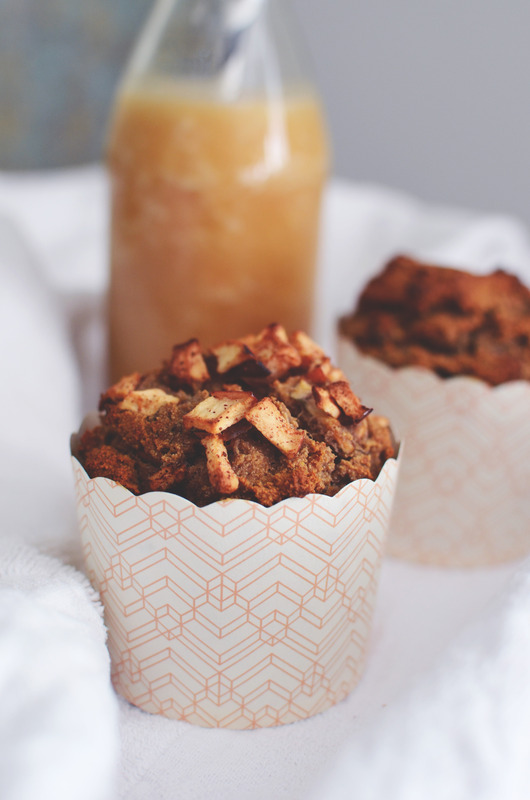 Besides being delicious, these muffins will also make your home scent pretty awesome. So make ’em just to enjoy the lovely aromatherapy! 1. Set the oven at 200°C / 400°F. Mix all dry ingredients together in a big bowl and set aside. 2. Mash the banana with a fork and mix it well with the oil, milk, eggs, honey and vanilla extract until quite smooth. Combine the wet ingredients to the dry ingredients. 3. Chop the apples into small pieces and sprinkle them with cinnamon. Chop also the dates into smaller pieces. Add then the apple and date pieces into the muffin batter and mix well. 4. 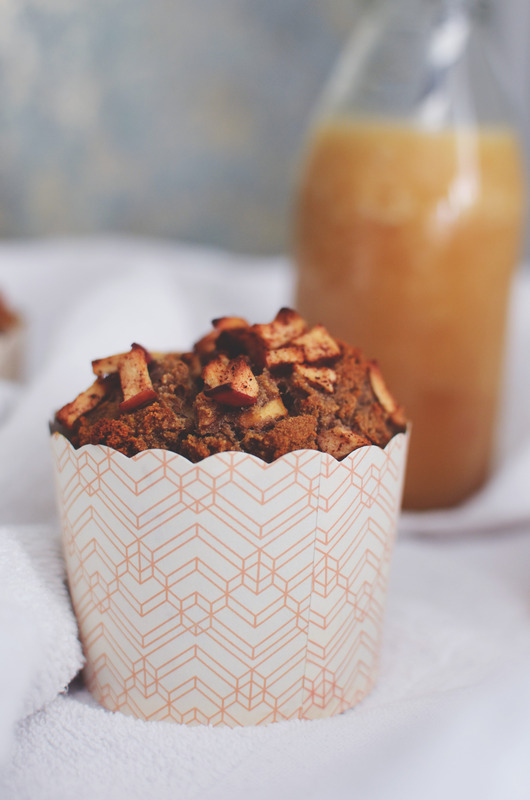 With the help of two tablespoons, pour the batter in muffins cups and decorate with some pieces of apple and dates. Bake for about 25 to 30 minutes. Tagged apple, autumn, baked goods, dates, muffins, treats.